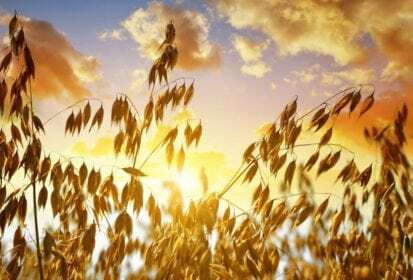 CNS Canada — Canadian oat crops are in reasonably good shape following recent rains, though prices may find themselves under pressure as end-users are well covered for the time being. Farmers planned on seeding about 3.15 million acres of oats in the country in 2018, down only slightly from the 3.2 million seeded the previous year, according to Statistics Canada data. Ryan McKnight of Linear Grain at Carman, Man. said the 2017 crop was very good quality, and ending stocks are expected to come in at about one million tonnes both in 2017 and again in 2018. The good quality last year meant end-users are getting a better milling yield — and need fewer oats as a result, he added. “We’re into that time of year where it’s a weather market,” said Scott Shiels of Grain Millers Canada at Yorkton, Sask. Oat crops, he said, were seeing even emergence and were looking good at this early stage, with recent rainfall helping moisture conditions improve in most areas. However, there was probably too much rain in some cases. Weed issues were also starting to become a problem following the rains. Shiels said his company had pulled old-crop bids two weeks ago and was well covered for the new crop, although there was still some contracting going on. He had a new crop bid of around $3. per bushel, but noted line company bids were generally lower as they were still uncertain over their new-crop programs. In addition to the large supplies weighing on prices, McKnight said the end-use specifications for oats were becoming more specialized, which sends different price signals. For example, some millers may want gluten-free certification, while others are looking for glyphosate-free oats. “It’s becoming a ‘foodie’ product,” said McKnight. — Phil Franz-Warkentin writes for Commodity News Service Canada, a Glacier FarmMedia company specializing in grain and commodity market reporting. Follow him at @PhilFW on Twitter.